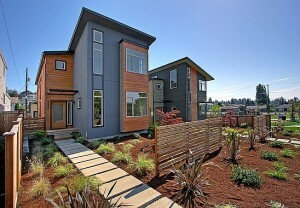 Seattle Green Builders – Selling in 2014! When the Seattle real estate market began improving by leaps and bounds last year, we took a closer look at Seattle green builders who were “raising roofs to meet the demand” in a post entitled Seattle Green Builders – Now Selling!. Now almost a year later, those same builders are humming along, but we’ve got some new editions we thought you should know about. All the builders listed here are not only green, but have homes currently for sale or about to hit the market! With 10 projects under their belts, and 3 more ‘on the boards‘, Build Urban caught our attention when they recently broke ground on their Canopy at Maple Leaf project. Not only did they preserve the towering cedars on the lot, and incorporate existing features (like the curved driveway), the homes themselves will be a mix of both traditional and modern architecture (less likely to stand out like sore thumbs! ), and they’ll all be 5-Star Built Green. While they call themselves small, and focus on a limited number of projects each year, R. Thoreson Homes specializes in energy efficiency, and using existing infrastructure to minimize environmental and neighborhood impact. Their latest projects include West Seattle – 48th (4 new modern townhomes), and a more traditional Mt Baker Residence, which was just written up as a Built Green Featured Home. Bright. Green. Living. is their motto and they seemingly live up to that by building and rehabbing green homes all over Seattle. Their latest projects now under construction include 4 Star Built Green townhomes in both the Central District and Beacon Hill, but they’ve got a slew of other interesting projects in progress. If you like sleek, modern, clean & green, check these guys out – their photo gallery will delight! As always, give us a call if there’s a project or home you’d like to see! ← Don’t Miss the 2013 Green Building Slam!